An English supermarket is showing its patrons how to get the latest in slave fashion. 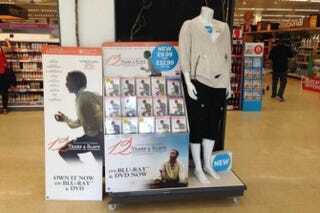 According to The Independant, an Oxford, England location of English grocery store Sainbury’s put a poorly planned mannequin next to its display for the 12 Years A Slave DVD and Blu-ray release. The mannequin is dressed like Solomon Northup, tattered shirt and pants with a twig in the pocket to complete the look. A customer took a picture of the display and uploaded it to Twitter. The mannequin had a tag around its neck priced for the DVD, so the look was not for sale. A Sainsbury representative told The Independent: “We can only apologise. It’s been taken down from the Heyford Hill store and clearly should never have gone up in the first place." Is this display racist or just poorly planned? Let us know in the comments.